Ann-Marie Faria is a principal researcher at AIR with a focus on quantitative analysis and methodology. Her primary research foci are quality issues in early childhood education and understanding how educators integrate data into educational decision making in their classrooms. Dr. Faria has over nine years of experience conducting applied research in the field of early childhood education, with a focus on Head Start students. At AIR, Dr. Faria currently works on the Regional Education Laboratory (REL) in the Midwest as the lead researcher on the early childhood education alliances. For REL-Midwest, Dr. Faria is leading a study that examines Great Start to Quality, Michigan’s Tiered Quality Rating and Improvement System (TQRIS). 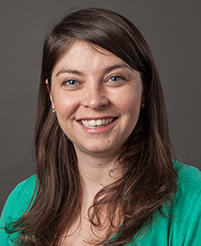 In this study Dr. Faria will lead a series of analyses that examine the distribution of quality across early childhood education settings in Michigan and will also conduct sensitivity analyses that examine alternative calculation systems for Michigan’s TQRIS. Dr. Faria also has extensive experience in applied research that links teachers’ use of data with students’ outcomes. In the Bill and Melinda Gates-funded Urban Data Study, she conducted a research study in four large urban districts that linked teachers’ report of data use with their students' actual achievement on state assessments. She is currently evaluating a student data dashboard system in Texas, funded by the Michael and Susan Dell Foundation, and is leading an Institute of Education Sciences (IES) -funded randomized control trial of the impact of a web-based early warning system. Dr. Faria has designed and worked on multiple randomized control trials, with randomization at both the school- and student-level, including an IES-funded student-level randomized control trial examining the impact of Check & Connect - a drop-out prevention program; the Access to Algebra randomized control trial conducted by the Regional Educational Laboratory- Northeast and Islands; and the Success for Kids (SFK) evaluation, a school-level randomized control trail of social emotional programming in elementary schools. Dr. Faria also has extensive experience working on implementation and survey studies with both primary and extant data sets. Finally, Dr. Faria has also spent time in the classroom as an elementary school teacher in the DC area.